I was recently asked to make a tank top for a Bride. She apparently liked beer haha. This was what I came up with and it was a hit at the Bachelorette party! TGIF! Deb here with my first post for Sunsational Stamps. As soon as I saw the Hunny Bunny digi stamp, I knew that I had to put it on a Onesie! I changed the format of the Hunny Bunny stamp in my Silhouette software to make it a cutting files. I then broke the file down into smaller parts so I could cut each section of the bunny separately. I'm soo glad I have an enormous supply of HTV and Onesies, I didn't have to leave the house to purchase any additional supplies! Any of Sunsational Stamps digi files can be made into cut files in many electronic cutting machines software. Have a great day! Hope you enjoyed my version of the Hunny Bunny digi file! As part of the 2017 Canvas Corp Creative Crew, we were challenged to show our style of creating on a 4x4 canvas. 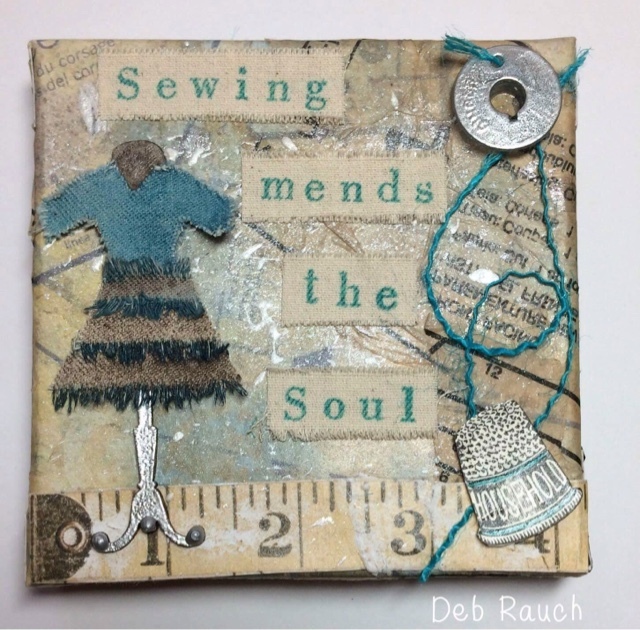 Since I love sewing, and collect vintage sewing items, this was the perfect theme, I started with a Canvas Corp 4x4 stretched canvas. Primed it with white gesso, then the fun began. I used pieces of the 7 Gypsies Seamstress paper collection as my first layer. Then I added a small piece of an old sewing pattern. I splattered some metallic white High Impact paint as well as some Navy Glimmer Mist on the background. On the chipboard dressform, I heat embossed the bottom half with Brutus Monroe Pure Silver embossing powder. The denim dress is just a dress I cut out of Canvas Corp denim, and added some frayed layers on the bottom half. The bottom layers were sprayed with Tattered Leather Glimmer Mist with some Navy Glimmer Mist added on the edges. The bobbin is just s clear plastic bobbin that I cut in half and embossed with the same silver embossing powder. Then I wrapped some burlap pieces around the bobbin and let the excess fall where it may. The thimble is from the 7 Gypsies Seamstress Collection also. Then I cut pieces of canvas and did my stamping.